"Now, now me boy. True power doesn't come from chaos. That'll just make you a puppet--and that is no power at all. And it doesn't come from Sigmar, either!" 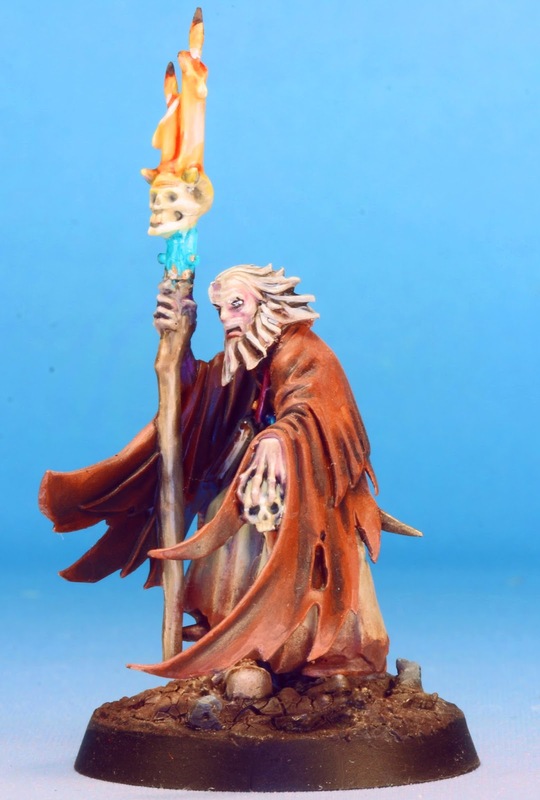 cackled the wizened old man as he hackec a glob of phlegm at the mention of Sigmar. He grabbed his corpulent assistant by the arm and lead him the dais. His familiar followed him, psychically knowing where to shine the light from its candle to illuminate its master's project. "No, it comes from the mastery of life and death, and once I am done with my children, Ottersricht shall be ours!" As I said a while back now, I already had the Stitcher done when I wrote my blog post on Ottersricht, it just took me a while to get my photo gear out and get a picture. And here he is in all his glory. 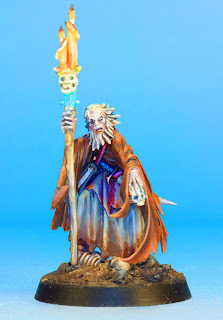 He's a simple conversion, the plastic Necromancer with a flagellant head and a staff top from the Empire wizard set. I wanted him to look both insane and dirty, to show that he spends his days and nights pouring over lost tomes in the catacombs of Ottersricht, and I think I achieved that look quite well. The brown robes where based in Mournfang brown and shaded by mixing in the darkest blue I own. 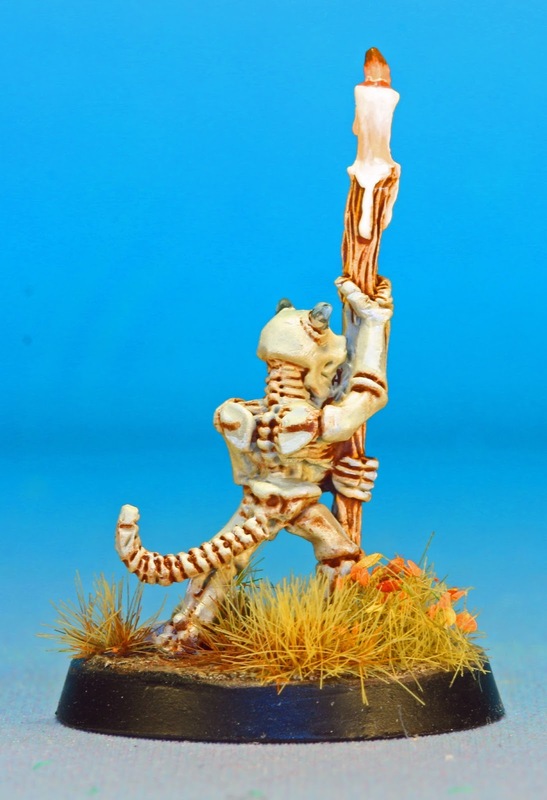 They were highlighted by adding P3 Menoth White highlight. The corset was based with flesh, but highlighted and shaded the same, as was the lower robes which were based with a grey of some sort (I can't remember!). His flesh was painted with Rakarth flesh shaded with purples and highlighted with white. 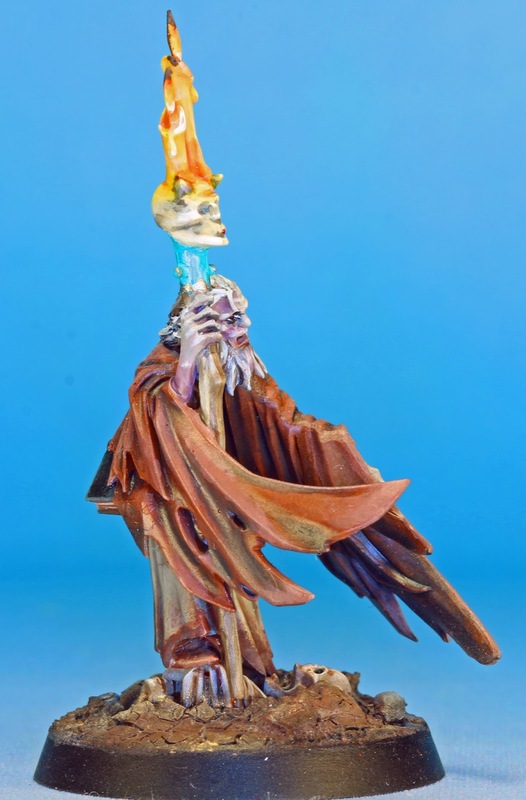 I also wanted to add a few spots of color, so the piece below the skull on his staff was heavily verdigrised and the knife handle was painted with bright blues. 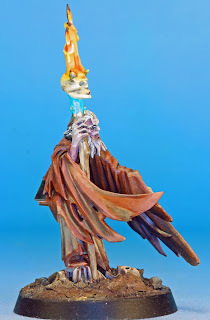 I used a lot of pigments on him, and probably over pigmented the base and muted the highlights too much. I might go back with a dry brush or something in the future. His familiar is an old Jes Goodwin Familiar. He was pretty simple to paint. 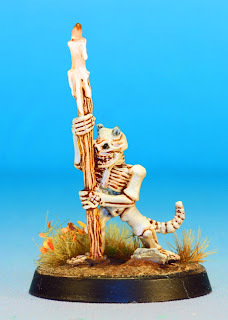 I airbrushed him Khaki, the zenithally applied bone and white highlights at progressively higher angles. 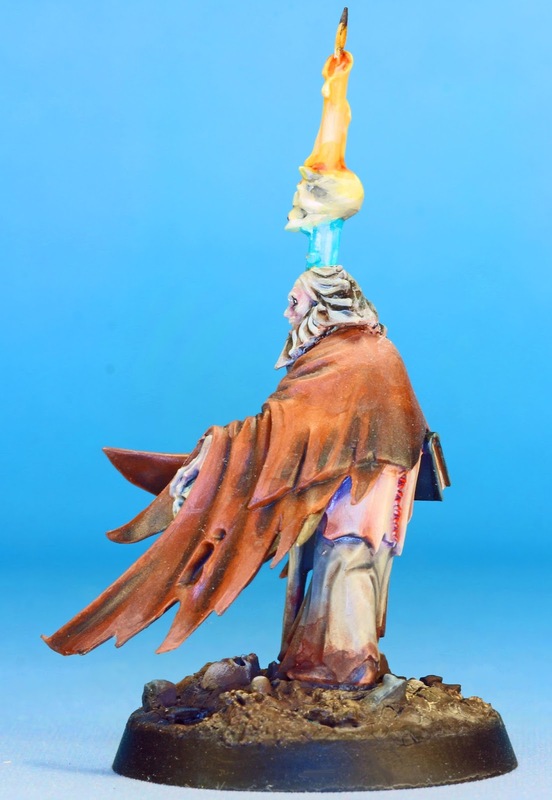 The staff was painted with a light brown, which I did not highlight due to the detailed sculpting. 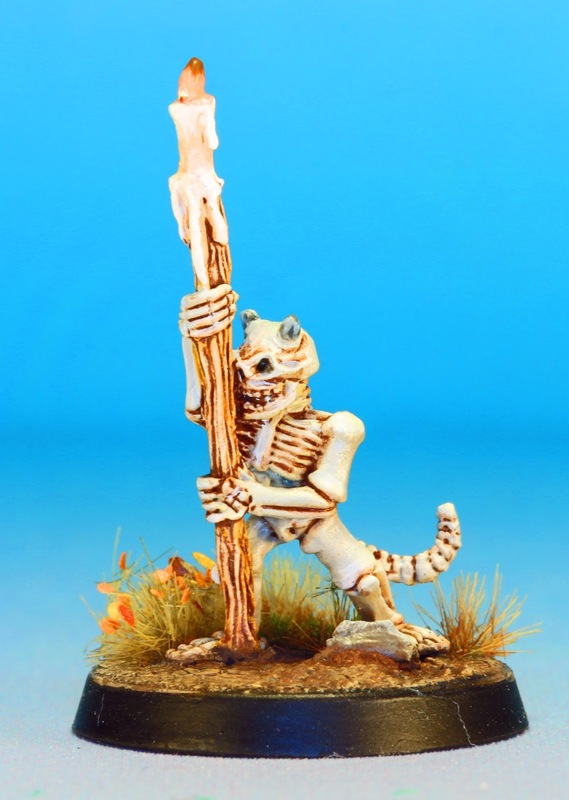 Next, I applied a Brown oil pin wash (the now discontinued MIG Brown Wash) to the staff and the skeleton. When that was finished I painted a final highlight on the skeleton of pure white and painted the horns grey and mixed in white for the highlights. My goal with all the Ottersricht miniatures is to practice my blending and use as thin of layers as I can get. I was happy with the techniques I used to shade, but I didn't quite get the highlights as I would have wanted to. Still pretty happy though. They look great. I like the conversion work you did. 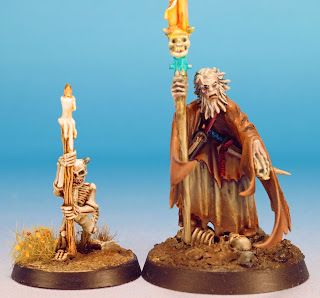 I think using new models and doing cool stuff with them can be Oldhammer. FWIW. Funny tell that to Blue! The whole presence instils fear, I love it! Thanks, he does look quite mad! New Domain and a Contest! Bring Out Yer Dead [Lead]!